In an interview with Liberté Politique, theologian Xavier Lacroix points out that the frozen embryo does not change when her parents decide later not to implant her; the parents change their mind. “The embryo is only the victim of that change.” “Because scientific logic considers human life as a continuous process from fertilization on, ethical and legal reasoning can legitimately claim to protect that process in the name of the cardinal principle of [human] dignity.” This explanation neatly summarizes and illustrates the argument in the Introduction and First Part of the 2008 Instruction Dignitas personae by the Congregation for the Doctrine of the Faith. Lacroix, a member of the CCNE, supports Opinion #112 “with reservations”, which he and ten other members enumerated and appended to the opinion. 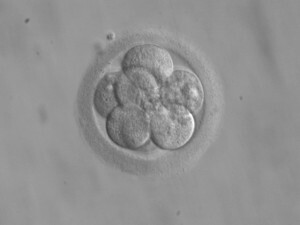 In their view, additional questions should be addressed, which can be summarized in four points: the legal system should fundamentally forbid research on human embryos and ESCs; the dignity of a human embryo depends not on the parents’ plans but on its nature; the production of surplus embryos should be decreased and eventually halted by law; all creation of embryos for research should be ruled out.